A recent article outlined my ineptitude in the art of fishing. Now, I’m going to write an article on hunting – an endeavor in which I am equally helpless. For rabbits and ruffed grouse, gender made no difference. We were allowed to shoot both males and females – mainly because there’s no way to tell the difference without taking a close look at the animal. There’s only one way to get a close look. Shooting any of them was perfectly legal. Pheasants, on the other hand, were easy to distinguish. The males had a nice white ring around their necks. Perhaps that’s why they’re officially known as “Ring-Necked Pheasants”. With pheasants, it was perfectly legal to shoot the males. The females were strictly off-limit. We neophytes couldn’t really make a distinction between a female pheasant and a ruffed grouse. Thus we decided to yell, “RUFFED GROUSE!” whenever we saw a bird we could shoot at. It might help us convince the game warden that shooting a female pheasant had been an honest mistake. We were walking through an open field about an hour after our arrival when a male pheasant ran across the field in front of us. One by one we neophytes emptied our weapons. Three men had shotguns that held three shells; my shotgun had a broken clip; thus it held just a single shell in its chamber. Do the math: ten shots fired and one pheasant still running across the field. The two veteran hunters then demonstrated the proper way to rapidly fire six more shells. The bird continued its mad dash to freedom. I was reduced to uncontrollable laughter. I watched as the others reloaded while running across the field. Then they ran up and over a hill and out of sight. Soon I heard ten more shots. The volley of shots was immediately followed by a volley of cursing. Doubled over in laughter with tears in my eyes, I decided to stay exactly where I was. I had no idea where the pheasant was leading the other members of my hunting party. I wanted to be easily seen in that open field so I wouldn’t accidentally be in the line of fire. A short time later I heard another barrage. I counted a total of fifteen shots. All five men had emptied their guns once more. By the angry words that followed, it was obvious the bird was still on the loose. In fact, the bird had finally remembered he could fly. As he took to the sky and disappeared from sight, the five men returned to the open field where I was trying hard to stifle my unbridled laughter. The scorecard now read: six hunters, forty-one shots fired, one bird flying away victorious. I wonder how many times that bird told his story to his grandchildren. The shooting and shouting set off by one bird must have scattered all the wildlife for miles around. We spent another three of four hours in the woods and saw virtually nothing. At one point, I even trudged through a mass of thickets trying to scare rabbits out into the open where somebody else might be able to get off a shot. Not only was I a lousy hunter, I wasn’t a very good Beagle either. Near the end of our expedition I saw a squirrel running along the top of a hill. I took careful aim and fired. I finally hit something, but that tree was too hard to clean and carry home; I left it where it was. Out of frustration, I took a shot at a large boulder. It also went unscathed. I went home and put away the trusty shotgun. I refused to be embarrassed any further. Since then I have collected a complete set of Foxfire books. These are books written by high school students in Appalachia. Each story is based on interviews with older folks who have lived by their wits and skills handed down over the centuries. Anything you’d want to do to get by can be found in the pages of the nine-volume set. The instructions range from building a cabin to slaughtering a hog. Candle making and vegetable canning all also covered. I bought the books as a precaution. If we ever run out of fossil fuels and are reduced to living a primitive lifestyle, I can learn how to make whatever we need to survive. I just hope and pray my food supply won’t depend on my hunting and fishing skills. I’ve been fishing for as long as I can remember. In the mid 1940’s I joined my family in our annual trek to southern New Jersey. My earliest memories find our family spending two hot summer weeks on my Uncle Lewis’ cabin cruiser – the Sea Urchin. It wasn’t a large boat; the cabin slept four, at most. My parents, my brother Lew, and I slept inside. My older brothers, Bill and Lew, slept out on the deck. We never left the dock so I don’t know if the engine worked or not. Each morning we’d drop the crab traps in the water along with some fishing lines before we even thought about breakfast. Whatever we caught during the day became lunch and dinner. We dined heartily on flounder, sea bass, perch, eel, and blue point crabs. I can honestly say that I caught my fair share of the bounty. Of course, being the smallest, I was usually relegated to using a hand line. In all honesty, from time to time I was permitted to use one of the rods and reels… until my first, and only, cast of the day. That is where the bird’s nests come into this story. I possessed an uncanny skill of getting the fishing line hopelessly tangled. My older siblings and parents referred to my snarled messes as bird’s nests. My mother was usually given the duty of untangling my disasters while I returned to my trusty stick with the fishing line wound around it. As I grew older, my casting problems continued to curse me. They also cursed my older brother, Lew. Sometime around the summer of 1954, my family was on a picnic at Raccoon State Park in Pennsylvania. I decided to go fishing. Being ten years old, I didn’t need a license – I just needed someone to cast the line for me so I wouldn’t be spending all my time untangling the mess. After two casts, each followed by fifteen minutes of untangling, my brother offered to cast the line for me. This worked great until the game warden arrived and asked Lew to show him his fishing license. He had none, but, being totally honest, he explained that he wasn’t fishing, he was simply helping his little brother. The game warden was almost convinced when I shouted, “I got one!” The one I pulled in was about four inches long and was immediately tossed back into the lake. The game warden must have seen things differently. He obviously saw it as a “trophy” and charged my brother $25.00 for the honor of watching me pull it in and throw it back. In those days, $25.00 would have fed our family for a week or two. It was the most expensive fish I ever caught, but I didn’t pay for it. So I can still laugh about it. In 1958 my other brother Lew and I, along with a couple of friends, borrowed our brother Bill’s car and went on a fishing excursion up the Allegheny River. As we left home and headed for the river, we all agreed on a bet. We’d each throw in $2.00. Whoever caught the biggest fish would get half the “pot” and whoever caught the most fish would get the other half. We fished at several different locations and I was the only person to catch anything. I believe it was the same little fish I had caught at the state park – and it hadn’t grown an inch. But it was the biggest fish caught that day and I had caught the most fish. The other three guys refused to pay. Talk about sore losers! The most eventful part of that outing was when my sixteen-year-old know-it-all brother decided to take a short cut over the railroad tracks… even though there was no road where he wanted to go. Getting the front tires over the first rail was a bit bumpy, but successful. Getting the front tires over the second rail was also bumpy, and left the frame of the car sitting firmly on the tracks… with none of the wheels touching the ground. It’s a good thing there were four of us in the car. Somehow we managed to jack up the back end of the car and shove hard enough to get the rear wheels between the tracks. We then repeated the process and got the car completely off the tracks. A short time later a freight train came through and we all realized how lucky we’d been. It wouldn’t have been easy explaining to Bill how his car got hit by a train while the four occupants stood and watched. When I was in my thirties or forties I went fishing in the Gulf of Mexico with my brother-in-law, Mac. After trying our luck near the mouth of a river north of Bradenton, I finally caught a small sunfish. It might have been seven or eight inches long. I was about to throw it back when Mac suggested I use it as bait. Fishing in a moving boat works pretty well for me because I can simply drop the bait over the side and slowly let the line out. I get far fewer bird’s nests that way. The downside is that sometimes I’ll get a bite while I’m letting out the line and I miss the opportunity to hook the fish. That’s precisely what happened on this occasion. When I pulled my line in to make sure I still had my bait, I discovered that my sunfish was now just a little bit more than the eyes and nose. The rest of the fish had been taken away with a single bite. Considering the size of the teeth and mouth on whatever took that bite, I’m glad I didn’t hook the beast. I still go fishing from time to time. If you’ve been reading the articles on this blog, you might remember my article about fishing in British Columbia. On that trip, I paid almost $100 for the license and never dropped a line in the water. However, both of my brothers, Lew and Lew, and my nephew Terry went beyond the initial costs. They paid about $100 each per day to go out in a fishing boat. They each caught one salmon and took the fish to a processing plant to have them filleted, smoked, and packaged. The way I figure it, each of those fish cost about $325. I’ll admit they were much bigger than the $25.00 fish I caught back in 1954. I’ll also admit that we’ve had a bit of inflation over the last fifty years. But I know we could have bought a ton of groceries for the money that was spent to bring home those three fish. I’ll bet we could’ve even bought a few bowls of authentic Chinese bird’s nest soup. When I recently wrote an article about the Burning Boots of British Columbia, I casually mentioned that we were in Canada to fish. My two brothers, two of our nephews, and I started a tradition a few years back when we all met at Last Mountain Lake in Saskatchewan. That lake should have been called LOST Mountain Lake because there wasn’t even a hill within two hundred miles. In Saskatchewan we fished for Wall-eyed Pike and Northern Pike and had mediocre success. Last year we were told that the fishing camp we went to on Last Mountain Lake was closed. It was too late to make other arrangements. Thus, we spent more than a year planning this trip to British Columbia. We chose British Columbia – Vancouver Island to be more precise – for a number of reasons. First, because we could fish for Pike and trout in the fresh water lakes and streams, and also fish for salmon, halibut, and other salt water fish along the inside passage between the islands and the mainland. Second, because we could fish for Dungeness Crabs and Prawns. Third, because my one brother lives in the Pacific Northwest and he did all the legwork. It’s hard to believe that about thirty years ago all five of us lived within walking distance of each other. Today, one of our nephews lives in Tampa and his brother lives in Colorado Springs. My oldest brother still lives in Pittsburgh and I live in North Georgia. 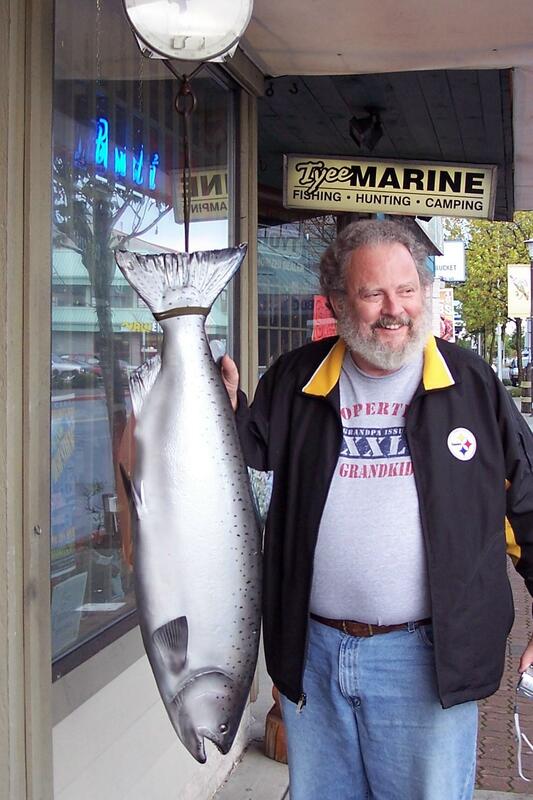 So, on the days leading up to the fishing foray, four of us flew into Seattle where my other brother picked us up and got us to his house in Port Townsend, Washington. By the time the sun was rising the next morning, we had already driven fifty miles and were waiting to drive onto the ferry that would take us to Victoria, the capital of British Columbia. With five of us, an inflatable boat, and all our luggage and fishing gear, we were lucky my brother had a crew cab pick-up as well as a Honda Civic. We used both vehicles. When we reached the Canadian shore, we passed through customs in less than five minutes. Then we sat in traffic for another forty-five minutes trying to get out of the holding area. It seems Canada was celebrating Thanksgiving in October and the city of Victoria was holding a marathon. The route of the race went directly between us and our destination. Eventually we got our break and passed through without running over any contestants. Our next stop, as far as I’m concerned, was a mistake. We stopped at a supermarket in Victoria that sold everything from food to home furnishings. We bought some basic food items and then decided to see what else the store had to offer. That’s when we discovered the sporting goods section. We bought a crab trap, heavy cord, and bait. We also bought our fishing licenses. In British Columbia, a non-Canadian angler must help pay the national debt of Ottawa. Because we would be fishing in both salt water and fresh water, we needed a non-resident license for each. In addition, we needed to buy salmon stamps just in case we might catch one of the elusive fish. The total cost was almost $100.00 (Canadian). The good news is that it was only about $85.00 U.S. The good news ended right there. About five hours later we pulled into the Roberts Lake fishing camp. We had stopped for lunch, more groceries, and various beverages that one might find at a men’s bonding ritual. Shortly thereafter we learned the rules regarding fishing in British Columbia. In the first place, to give the fish a fighting chance, an angler must never use a hook that contains a barb. The barb might hamper the fish’s opportunity to spit the hook out of his mouth. Next, the angler must never use any organic bait (living or otherwise) that might whet a fish’s appetite. In fact, artificial lures are also taboo. In British Columbia, fooling a fish is deemed worse than trying to fool Mother Nature. Based on those rules, I’d say the angler doesn’t have a fighting chance. I’d also venture to guess that the rules were written by the commercial fishermen. Naturally, the commercial fishermen must also follow those same rules. But a barbed hook and no organic bait or lures makes little difference when a person is using nets. The next bad news came after we got the inflatable boat inflated. My brother from Washington and my nephew from Colorado went out on the lake to try their luck. Their combined weight of close to 500 lbs made the boat float rather low in the water. The other three of us watched and fished from the dock. A couple of hours later we determined that if there had ever been any fish in that lake, they must have migrated south for the winter. The original plan called for us to go out the next day into the salt water with a guide in a fully equipped fishing boat. However, I misunderstood that part of the plan. I thought it was going to cost us $90.00 for all of us – not each of us. Since I had already spent far more than I had planned for the license, I bowed out of that excursion. My nephew from Tampa had already declined that tour, so he and I decided to go find a place to catch crabs and prawns. After four hours of driving along the coast we found one place where we could walk up to the water’s edge without being on private property. The water was less than a foot deep for as far out as we could see. The only way to drop a trap into deep water was with waterproof boots or waders. So we went sightseeing in the town of Campbell River. The three who went out in the guided boat (twice) caught one salmon apiece. A few more were hooked, but got away. They admitted that the guide cheated and put a herring on each of their hooks. Otherwise, they would have come back empty handed. They took their catch to a processing plant and had the fish smoked. I don’t know how much that part cost, but the license and guide cost them over $270 each. I think smoked salmon at the grocery store is much less expensive. Before we left for home, we made reservations to return next summer. I’m not sure if I’ll be able to go or not, but if I do, I won’t buy a fishing license. Salmon is much cheaper in Georgia.